1) If really needed, expand Medicaid to address the uncovered poor (easy to expand an existing, well-established program). 2) Make health insurance tax-deductible for individuals (like it is for businesses). 3) Allow insurers to compete across state lines (competition always brings costs down, improves quality and choices). 4) Expand Health Care Savings Accounts (Tax-deferred, like-IRAs). 5) Cap Medical malpractice lawsuit awards (a big upward driver of health care costs). 6) Subsidize those with expensive pre-existing conditions. This could probably be done through Medicaid. 7) Those who show up at an Emergency Room without health insurance would be treated, but then sanctioned criminally. Probably pay a fine or do community service. Multiple offenders risk jail time (like deadbeat dads). That takes care of the Emergency Room problem. It’s a requirement that everyone have some kind of health insurance done the right way. 8) Medical costs and doctor visits should be tax-deductible to encourage illness prevention. 9) Restore the $716 billion that was stolen from Medicare to pay for ObamaCare. 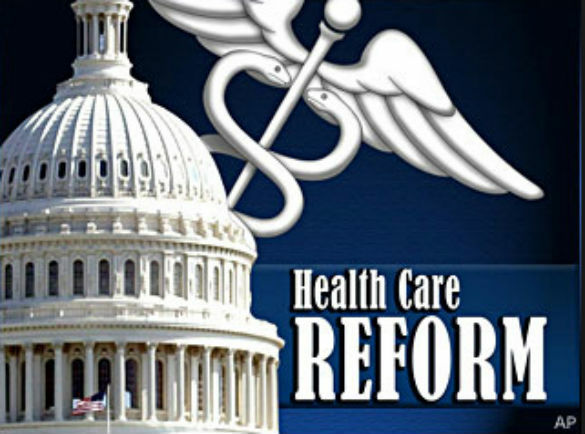 These reforms could fit on a single sheet of paper — in contrast to the 2,700-page ObamaCare law, plus more than 20,000 pages of ObamaCare regulations that have been added to the law so far. We bring overall health care costs down by phasing out third-party payment systems as much as possible (including employer-provided insurance) and by making individuals responsible for the lion’s share of their own health care coverage. Then watch health care costs drop. Flat screen TVs, personal computers, and cell phones used to be prohibitively expensive for most people. Now almost everyone can afford them, even people on welfare. A flat screen TV used to cost $20,000 when they first hit the market. Now they cost $600 — for a good one. When the market is allowed to operate freely, without a lot of government interference and mandates, costs always come down — often to almost nothing. And we get lots of innovation — new products, new discoveries. We then take care of the elderly with Medicare (when health care really can become prohibitively costly). And we provide for the poor with Medicaid — most of which is administered by the states. All this was happening under the pre-ObamaCare system. We had a mostly good health care system. It just needed a few tweaks, some minor adjustments — much like the NFL makes relatively minor tweaks to the rules of pro-football every now and then to make the games better. There was no need to completely reorganize 18 percent of the U.S. economy with ObamaCare. For conservatives to win national elections consistently, emphasizing the prosperity made possible by free-market capitalism is certainly important, but is not enough. People want freedom and prosperity. But they also want security. And most are willing to sacrifice some freedom and prosperity for a bit more security, especially women. Security is actually part of freedom and prosperity. If people feel more secure, they feel more free, more prosperous, and are usually happier. Aren’t you happier when you feel more secure? Until conservatives address the “security” part of what people want more directly, we will continue to have trouble winning national elections. To read more from conservative writer Ben Hart go to EscapeTyranny.com. Part 1: What a Conservative Social Safety Net Would Look Like. Submitted by thequadfather on Tue, 12/24/2013 - 04:58. The state of Georgia came up with a good workable solution for so called pre existing conditions. before if my boss changed my insurance plan, my chronic esophagal reflux would be considered a pre-existing condition. I had to be insured by the new company for awhile before I was able to receive reimbursement for my medical costs associated with this condition. This was not fair, because I had no choice in the change. Well, for everybody entering a policy with a pre-existing condition, there is one that is leaving the policy with a pre-existing condition, going to another company. The insurers unfairly get to avoid costs they otherwise wouldn't have if everybody had stayed withn the insurance company that they had. So to solve this, the state of Georgia passed a law that said that if you were already covered when you started your new insurance, the new insurance company had to treat it as continual coverage. In other words, no pre-existing condition status exists. This is far more sensible than the situation with Obamacare where they just outlaw pre-existing condition status entirely, allowing people to bilk the system by waiting to get sick before they sign up. With the Georgia law, the patient starts paying before he gets sick, and when he does get sick he continues to get treatment on a contiguos basis, even if his boss decides to change plans. And there is no way to cheat the system.